For the past 22 years, the American Bar Association Section of Real Property, Trust and Estate Law with the permission of the University of Miami School of Law, releases several extensive reports highlighting the various lectures and proceedings of the Heckerling Institute, one of the nation’s largest estate planning conferences, held every year in January. 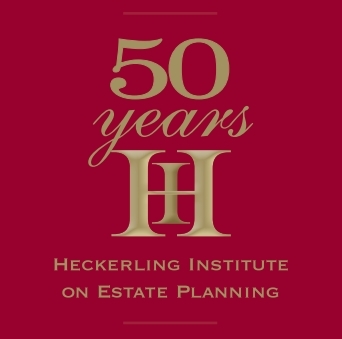 This week in Orlando, Florida, the 53rd Annual Heckerling Institute on Estate Planning took place. To view, download and access these extensive reports (which are still being updated and added), see below. Further, at the above website, you can also access reports from prior Heckerling Institutes as well. We, at The Ultimate Estate Planner, Inc., would like to take the time to thank the American Bar Association and our fellow colleagues who have taken a great deal of their time and effort to provide this great service and source of information to the rest of the estate planning community. The content herein is to be used for informational purposes only. Neither the Heckerling Institute nor the University of Miami represent or warrant the accuracy or completeness of the information contained in these Reports, and do not endorse the content. Moreover, the views expressed herein do not necessarily reflect the views of the Heckerling Institute or the University of Miami. In no event will the Heckerling Institute or the University of Miami be liable for any damages that might result from any use of or reliance on these Reports.